Outer space (often simply called space) comprises the relatively empty regions of the universe outside the atmospheres of celestial bodies. Outer space is used to distinguish it from airspace and terrestrial locations. Contrary to popular understanding, outer space is not completely empty (i.e. a perfect vacuum), but contains a low density of particles, predominantly hydrogen plasma, as well as electromagnetic radiation, magnetic fields and neutrinos. Theoretically, it also contains dark matter and dark energy. The term outer space was first recorded by the English poet Lady Emmeline Stuart-Wortley in her poem "The Maiden of Moscow" in 1842, and also later attested to the writings of HG Wells in 1901.. The shorter term space is actually older, first used to mean the region beyond Earth's sky in John Milton's Paradise Lost in 1667. Outer space is the closest approximation of a perfect vacuum. It has effectively no friction, allowing stars, planets and moons to move freely along ideal gravitational trajectories. But no vacuum is truly perfect, not even in intergalactic space where there are still a few hydrogen atoms per cubic centimeter. (For comparison, the air we breathe contains about 1019 molecules per cubic centimeter.) The deep vacuum of space could make it an attractive environment for certain industrial processes, for instance those that require ultraclean surfaces. Stars, planets, asteroids, and moons keep their atmospheres by gravitational attraction, and as such, atmospheres have no clearly delineated boundary: the density of atmospheric gas simply decreases with distance from the object. The Earth's atmospheric pressure drops to about 1 Pa at of altitude. This is known as the Kármán line, a common definition of the boundary with outer space. Beyond this line, isotropic gas pressure rapidly becomes insignificant when compared to radiation pressure from the sun and the dynamic pressure of the solar wind, so the definition of pressure becomes difficult to interpret. The thermosphere in this range has large gradients of pressure, temperature and composition, and varies greatly due to space weather. Astrophysicists prefer to use number density to describe these environments, in units of particles per cubic centimetre. All of the observable universe is filled with large numbers of photons, created during the Big Bang, the so-called cosmic background radiation, and quite likely a correspondingly large number of neutrinos called the cosmic neutrino background. The current temperature of the photon radiation is about . Contrary to popular belief, a person suddenly exposed to the vacuum would not explode, freeze to death or die from boiling blood, but would take a short while to die by asphyxiation (suffocation). Air would immediately leave the lungs due to the enormous pressure gradient. Any oxygen dissolved in the blood would empty into the lungs to try to equalize the partial pressure gradient. Once the deoxygenated blood arrives at the brain, death would quickly follow. Humans and animals exposed to vacuum will lose consciousness after a few seconds and die of hypoxia within minutes. Blood and other body fluids do boil when their pressure drops below 6.3 kPa, the vapor pressure of water at body temperature. This condition is called ebullism. The steam may bloat the body to twice its normal size and slow circulation, but tissues are elastic and porous enough to prevent rupture. Ebullism is slowed by the pressure containment of blood vessels, so some blood remains liquid. Swelling and ebullism can be reduced by containment in a flight suit. Shuttle astronauts wear a fitted elastic garment called the Crew Altitude Protection Suit (CAPS) which prevents ebullism at pressures as low as 2 kPa. Water vapor would also rapidly evaporate off from exposed areas such as the lungs, cornea of the eye and mouth, cooling the body. Rapid evaporative cooling of the skin will create frost, particularly in the mouth, but this is not a significant hazard. Space may be cold, but it's mostly vacuum and transfers heat ineffectually; as a result the main temperature regulation concern for space suits is how to get rid of naturally generated body heat. Cold or oxygen-rich atmospheres can sustain life at pressures much lower than atmospheric, as long as the density of oxygen is similar to that of standard sea-level atmosphere. The colder air temperatures found at altitudes of up to generally compensate for the lower pressures there. Above this altitude, oxygen enrichment is necessary to prevent altitude sickness, and spacesuits are necessary to prevent ebullism above . Most spacesuits use only 20 kPa of pure oxygen, just enough to sustain full consciousness. This pressure is high enough to prevent ebullism, but simple evaporation of blood can still cause decompression sickness and gas embolisms if not managed. Rapid decompression can be much more dangerous than vacuum exposure itself. Even if the victim does not hold his breath, venting through the windpipe may be too slow to prevent the fatal rupture of the delicate alveoli of the lungs. Eardrums and sinuses may be ruptured by rapid decompression, soft tissues may bruise and seep blood, and the stress of shock will accelerate oxygen consumption leading to hypoxia. Injuries caused by rapid decompression are called barotrauma. A pressure drop as small as 13 kPa, which produces no symptoms if it is gradual, may be fatal if it occurs suddenly. The Fédération Aéronautique Internationale has established the Kármán line at an altitude of as a working definition for the boundary between aeronautics and astronautics. This is used because above an altitude of roughly 100 km, as Theodore von Kármán calculated, a vehicle would have to travel faster than orbital velocity in order to derive sufficient aerodynamic lift from the atmosphere to support itself. The United States designates people who travel above an altitude of as astronauts. NASA 's mission control uses as their re-entry altitude, which roughly marks the boundary where atmospheric drag becomes noticeable, (depending on the ballistic coefficient of the vehicle), thus leading shuttles to switch from steering with thrusters to maneuvering with air surfaces. In 2009, scientists at the University of Calgary reported detailed measurements with an instrument called the Supra-Thermal Ion Imager (an instrument that measures the direction and speed of ions), which allowed them to determine that space begins above Earth. The boundary represents the midpoint of a gradual transition over tens of kilometers from the relatively gentle winds of the Earth's atmosphere to the more violent flows of charged particles in space, which can reach speeds well over . This was only the second time that direct measurements of charged particle flows have been conducted at this region, which is too high for balloons and too low for satellites. It was however the first study to include all the relevant elements for this kind of determination – for example, the upper atmospheric winds. The instrument was carried by the JOULE-II rocket on January 19, 2007, and traveled to an altitude of about . From there it collected data while it was moving through the "edge of space". To perform an orbit, a spacecraft must travel faster than a sub-orbital spaceflight. A spacecraft has not entered orbit until it is traveling with a sufficiently great horizontal velocity such that the acceleration due to gravity on the spacecraft is less than or equal to the centripetal acceleration being caused by its horizontal velocity (see circular motion). So to enter orbit, a spacecraft must not only reach space, but must also achieve a sufficient orbital speed (angular velocity). For a low-Earth orbit, this is about ; by contrast, the fastest airplane speed ever achieved (excluding speeds achieved by deorbiting spacecraft) was in 1967 by the North American X-15. Konstantin Tsiolkovsky was the first person to realize that, given the energy available from any available chemical fuel, a several-stage rocket would be required. The escape velocity to pull free of Earth's gravitational field altogether and move into interplanetary space is about The energy required to reach velocity for low Earth orbit (32 MJ/kg) is about twenty times the energy required simply to climb to the corresponding altitude (10 kJ/(km·kg)). There is a major difference between sub-orbital and orbital spaceflights. The minimum altitude for a stable orbit around Earth (that is, one without significant atmospheric drag) begins at around above mean sea level. A common misunderstanding about the boundary to space is that orbit occurs simply by reaching this altitude. Achieving orbital speed can theoretically occur at any altitude, although atmospheric drag precludes an orbit that is too low. At sufficient speed, an airplane would need a way to keep it from flying off into space, but at present, this speed is several times greater than anything within reasonable technology. A common misconception is that people in orbit are outside Earth's gravity because they are "floating". They are floating because they are in "free fall": they are accelerating toward Earth, along with their spacecraft, but are simultaneously moving sideways fast enough that the "fall" away from a straight-line path merely keeps them in orbit at a constant distance above Earth's surface. Earth's gravity reaches out far past the Van Allen belt and keeps the Moon in orbit at an average distance of . Geospace is the region of outer space near the Earth. Geospace includes the upper region of the atmosphere, as well as the ionosphere and magnetosphere. The Van Allen radiation belts also lie within the geospace. The region between Earth's atmosphere and the Moon is sometimes referred to as cis-lunar space. Although it meets the definition of outer space, the atmospheric density within the first few hundred kilometers above the Kármán line is still sufficient to produce significant drag on satellites. Most artificial satellites operate in this region called low earth orbit and must fire their engines every few days to maintain orbit. The drag here is low enough that it could theoretically be overcome by radiation pressure on solar sails, a proposed propulsion system for interplanetary travel. Geospace is populated at very low densities by electrically charged particles, whose motions are controlled by the Earth's magnetic field. These plasmas form a medium from which storm-like disturbances powered by the solar wind can drive electrical currents into the Earth’s upper atmosphere. During geomagnetic storms two regions of geospace, the radiation belts and the ionosphere, can become strongly disturbed. These storms increase fluxes of energetic electrons that can permanently damage satellite electronics, disrupting telecommunications and GPS technologies, and can also be a hazard to astronauts, even in low-Earth orbit. 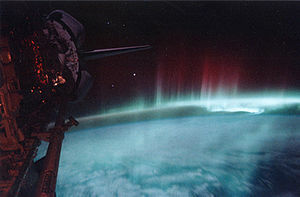 They also create aurorae seen near the magnetic poles. Geospace contains material left over from previous manned and unmanned launches that are a potential hazard to spacecraft. Some of this debris re-enters Earth's atmosphere periodically. The absence of air makes geospace (and the surface of the Moon) ideal locations for astronomy at all wavelengths of the electromagnetic spectrum, as evidenced by the spectacular pictures sent back by the Hubble Space Telescope, allowing light from about 13.7 billion years ago — almost to the time of the Big Bang — to be observed. The outer boundary of geospace is the interface between the magnetosphere and the solar wind. The inner boundary is the ionosphere. Alternately, geospace is the region of space between the Earth’s upper atmosphere and the outermost reaches of the Earth’s magnetic field. Interplanetary space consists of the space around the Sun and planets of the Solar System. It extends out to the heliopause where the influence of the galactic environment starts to dominate over the magnetic field and particle flux from the Sun. Interplanetary space is defined by the solar wind, a continuous stream of charged particles emanating from the Sun that creates a very tenuous atmosphere (the heliosphere) for billions of miles into space. This wind has a particle density of 5–10 protons/cm3 and is moving at a velocity of 350–400 km/s. The distance and strength of the heliopause varies depending on the activity level of the solar wind. The discovery since 1995 of extrasolar planets means that other stars must possess their own interplanetary media. The volume of interplanetary space is an almost pure vacuum, with a mean free path of about one astronomical unit at the orbital distance of the Earth. However, this space is not completely empty, and is sparsely filled with cosmic rays, which include ionized atomic nuclei and various subatomic particles. There is also gas, plasma and dust, small meteors, and several dozen types of organic molecules discovered to date by microwave spectroscopy. Interplanetary space contains the magnetic field generated by the Sun. There are also magnetospheres generated by planets such as Jupiter, Saturn and the Earth that have their own magnetic fields. These are shaped by the influence of the solar wind into the approximation of a teardrop shape, with the long tail extending outward behind the planet. These magnetic fields can trap particles from the solar wind and other sources, creating belts of magnetic particles such as the Van Allen Belts. Planets without magnetic fields, such as Venus, Mars and Mercury, have their atmospheres gradually eroded by the solar wind. Interstellar space is the physical space within a galaxy not occupied by stars or their planetary systems. The interstellar medium resides – by definition – in interstellar space. Intergalactic space is the physical space between galaxies. Generally free of dust and debris, intergalactic space is very close to a total vacuum. Certainly, the space between galaxy clusters, called the voids, is nearly empty. Some theories put the average density of the universe as the equivalent of one hydrogen atom per cubic meter. The density of the universe, however, is clearly not uniform; it ranges from relatively high density in galaxies (including very high density in structures within galaxies, such as planets, stars, and black holes) to conditions in vast voids that have much lower density than the universe's average. Surrounding and stretching between galaxies, there is a rarefied plasma that is thought to possess a cosmic filamentary structure and that is slightly denser than the average density in the universe. This material is called the intergalactic medium (IGM) and is mostly ionized hydrogen, i.e. a plasma consisting of equal numbers of electrons and protons. The IGM is thought to exist at a density of 10 to 100 times the average density of the universe (10 to 100 hydrogen atoms per cubic meter). It reaches densities as high as 1000 times the average density of the universe in rich clusters of galaxies. Silk, Joseph. Big Bang. New York: Freeman, 1977: 299.